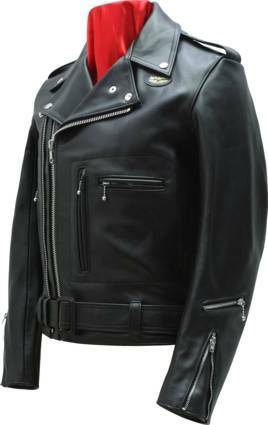 1966 saw the 10th anniversary of the Bronx and it was time for an upgrade of Lewis Leather’s most successful jacket.The modification included the innovative addition of a twin track front zip, previously unseen on any jacket and the dual entry ‘tunnel’ pocket on the back which allows the wearer to access their gloves or maps from the left or right with ease. A favourite of the 59 Club, many wearers used the back pocket more inventively by inserting a daily newspaper for added insulation against the cold! This jacket was the first to feature the zippered sleeve pocket. Unsurpassed for comfort and durability, the twin zip opening allows adjustment for extra winter clothing, ensuring a perfect fit for all seasons. Deluxe quality, extra supple hide, tough and wind proof, The Twin Track Bronx has 7 zip pockets, all easy to get at, including and insite wallet pocket, a handy coin pocket on the sleeve and a large ‘tunnel’ pocket on the back.